VSDs are categorised according to their location on the ventricular septum. The smaller membranous septum is located on the superior aspect whilst the larger muscular septum is on the inferior aspect. The VSD is normally of a significant size, which causes the systolic pressures between the ventricles to equalise. In mild TOF, the left ventricular pressures remain higher than the right ventricle, thus blood shunts from left-to-right through the VSD. These patients are normally acyanotic. 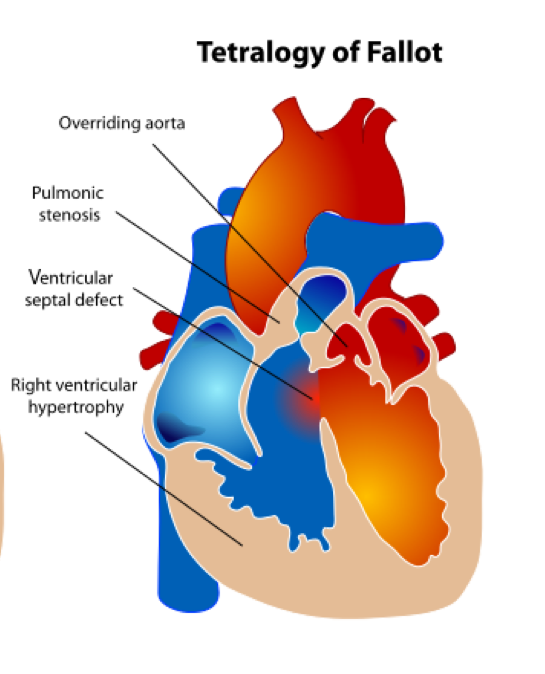 In more severe disease, due to increased right ventricular pressure (secondary to PS – see below) the shunt direction reverses from right-to-left allowing mixing of deoxygenated (“blue”) and oxygenated (“red”) blood. This results in lower oxygenated (“purple”) blood in the systemic circulation, hence patients are cyanotic. Pulmonary stenosis can be classified according to its location. The commonest site is the infundibular septum (50%). Some authors use the more descriptive term right ventricular outflow tract (“RVOT”) but they essentially refer to the same thing. The stenosis may also be valvular (10%) or a combination of both (30%). This results in impaired flow of deoxygenated blood into the main pulmonary artery (PA). It may be severe enough to cause intermittent RVOT obstruction (“RVOTO”) – this forms the basis of hypoxic episodes, commonly known as tet spells, which is further explained below. Hypertrophy of the right ventricle occurs in response to the high pressures it must overcome to pump deoxygenated blood through the RVOTO. This usually develops in utero and may be seen in chest x-rays as the ‘boot’ sign. Compared to the normal heart, the aorta in TOF is dilated and displaced over the intraventricular septum. Aortic dilatation is caused by an increase in blood flow through the aorta as it receives blood from both ventricles via the VSD. In severe TOF, multiple aorto-pulmonary collateral arteries (“MAPCAs”) may also form to help increase pulmonary blood flow. These infants have mild PS/RVH and are usually asymptomatic. However, the disease normally progresses as the child and the heart grows thus by age 1-3 years they will develop cyanosis. Infants born with moderate-severe PS may present in the first few weeks of life with cyanosis and respiratory distress. These infants may be prone to develop recurrent chest infections or fail to thrive. These can be further divided into TOF with pulmonary atresia (10% of TOF patients) or absent pulmonary valves (6%). These are true ‘duct dependent lesions’ as the only way deoxygenated blood can flow into the lungs is through a patent ductus arteriosus (PDA). These infants are often detected on antenatal scans. However, if undetected in pregnancy they will present within the first few hours of life with marked respiratory distress and cyanosis. Paroxysm of hyperpnoea – rapid, deep respirations secondary. Due to increased right-to-left shunting, carbon dioxide accumulates therefore stimulating the central respiratory centre. This unfortunately causes further right-to-left shunting thus perpetuating the hypoxia. May be precipitated by dehydration, anaemia or prolonged crying (induces tachycardia and reduced systemic vascular resistance). Loud, single S2: due to closure of aortic valve in diastole with absent/reduced pulmonary valve closure (P2) depending on the degree of stenosis. Pansystolic murmur: best auscultated either mid or upper left sternal edge (LSE). The smaller the VSD the louder the murmur and vice versa. Ejection click4: high pitch noise which occurs at the maximal opening of semilunar (aortic or pulmonary) valves. Clicks in TOF occur due to presence of dilated aorta. Normally heart immediately after S1. Continuous, machinery murmur: occurs in the presence of PDA with extreme forms of TOF, especially those on prostaglandin infusion. Best auscultated at the upper LSE or left infraclavicular area. Note: the murmurs may decrease in intensity during “tet” spells due to reduced pulmonary blood flow. Signs of congestive heart failure: sweating, pallor, tachycardia, hepatosplenomegaly, generalised oedema, bilateral basal crackles or gallop rhythm may be auscultated. 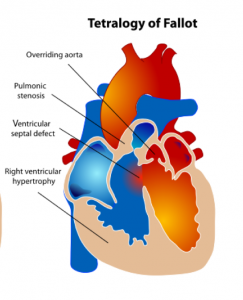 Isolated VSD: commonest CHD (15-20%). Does not cause cyanosis as the shunt is left-to-right unless Eisemenger syndrome develops. Sepsis: should be suspected in any infant with respiratory distress and hypoxia. ECG: may show signs of right axis deviation and RVH. Microarray: if genetic syndromes suspected (e.g. dysmorphic features, multiple anomalies). 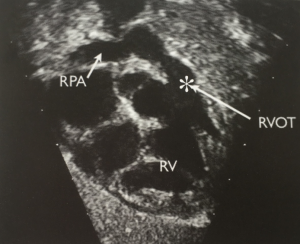 CXR: may show ‘boot’ shaped heart (RVH) and reduced pulmonary vascular marking (decrease pulmonary blood flow). 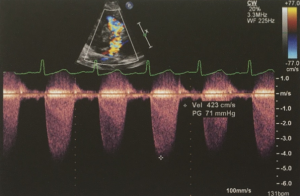 Echocardiogram: gold standard for confirmation of diagnosis. Cardiac CT angiogram: to delineate anatomy especially if coronary abnormalities suspected (e.g. MAPCAs). Cardiac MRI: in tertiary cardiac centres, MRI scans are of great value pre- and post- operatively to delineate the anatomy of the lesions and cardiac function. Useful if multiple aorto-pulmonary collateral arteries (MAPCAs) suspected. Cardiac catheter: this is performed under GA as an elective day case usually by the paediatric cardiologists. May be done as part of the pre-op assessment on the same day as the MRI to measure haemodynamics and delineate anatomy. Squatting: Parents may observe the infants squatting or keeping their knees to their chest – this manoeuvre helps increase venous return, therefore increases systemic resistance. Parents should be advised to put child in this position whilst awaiting medical review. Prostaglandin (PG) infusion: this helps maintain PDA in the more severe-extreme forms of TOF and must be started urgently following delivery to avoid the neonate collapsing. Depends on local practice, either PGE1 (alprostadil) or PGE2 (dinoprostone) may be used. Side effects to note include apnoeas, bradycardia and hypotension. Beta-blockers: propranolol is commonly used in both “tet” spells and prophylaxis in moderate-severe disease. It works by reducing the heart rate thus venous return . Saline 0.9% bolus can be used in “tet” spells as a volume expander to increase pulmonary blood flow through the RVOTO. Transcatheter RVOT stent insertion: this is sometimes done in the neonatal period for infants with severe-extreme TOF to relieve RVOTO. This is done to buy time until the child is bigger whilst providing a patent passage for pulmonary blood flow. 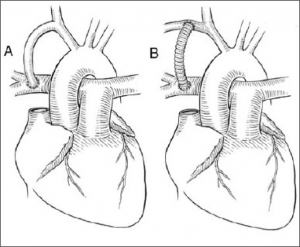 Modified Blalock-Taussig (BT) shunt: This procedure aims to mimic a PDA and increase pulmonary blood flow before definitive repair. It can be done either by anastomosis of the subclavian artery to the pulmonary artery or by creating an artificial shunt using synthetic material (usually GoreTex). The latter is called a modified BT shunt. Other alternatives include insertion of an RV to PA conduit (to bypass the RVOTO) and PA banding (to reduce pulmonary overloading, especially in pink TOF with mild PS). Performed under cardiopulmonary bypass via median sternotomy, this involves RVOT stenosis resection, RVOT/pulmonary artery augmentation and VSD patch closure. Depending on the degree of PS, PV is either repaired or spared. Timing depends on severity of symptoms but usually not performed younger than 3 months old or older than 4 years. Post operative care: immediately following surgery, the child will require stabilisation in Cardiac Intensive Care Unit (CICU). Once they are well enough they will be stepped down to the cardiology ward prior to discharge. Even post corrective surgery, patients are at higher risk of developing long term complications such as pulmonary regurgitation (PR), arrhythmias, exercise intolerance and sudden death. PR is not uncommon in the years following a complete repair. Mild PR may only cause limited effects and is well tolerated. Moderate-severe PR, especially in cases where the PV was spared, will require surgical or transcatheter pulmonary valve replacement with either an allograft (i.e. from another donor of the same species) or xenograft (i.e. different species, usually bovine or porcine) This is normally done 10-15 years after initial operation. Due to risk of long term complications, lifelong follow up is essential. This may include regular ECG, echocardiography and in cases of exercise intolerance, cardiopulmonary exercise testing (CPET). Prognosis is excellent as more than 85% children with surgically repaired TOF now survive to adulthood9. Dedicated adult CHD centres are available in some regions to ensure the continuation of care from paediatric to adult cardiologist. What type of TOF infants are prone to developing recurrent chest infections or failure to thrive? Tet spells aren't characterized by? What is the gold standard for confirming a diagnosis? What's the physiology behind squatting during a Tet Spell? 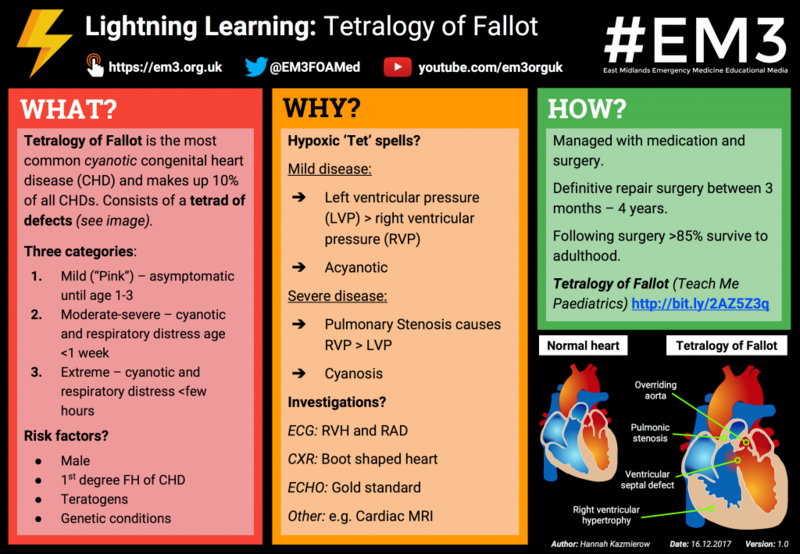 Which genetic defect has the highest percentage incidence of Tetralogy of Fallot associated with it? 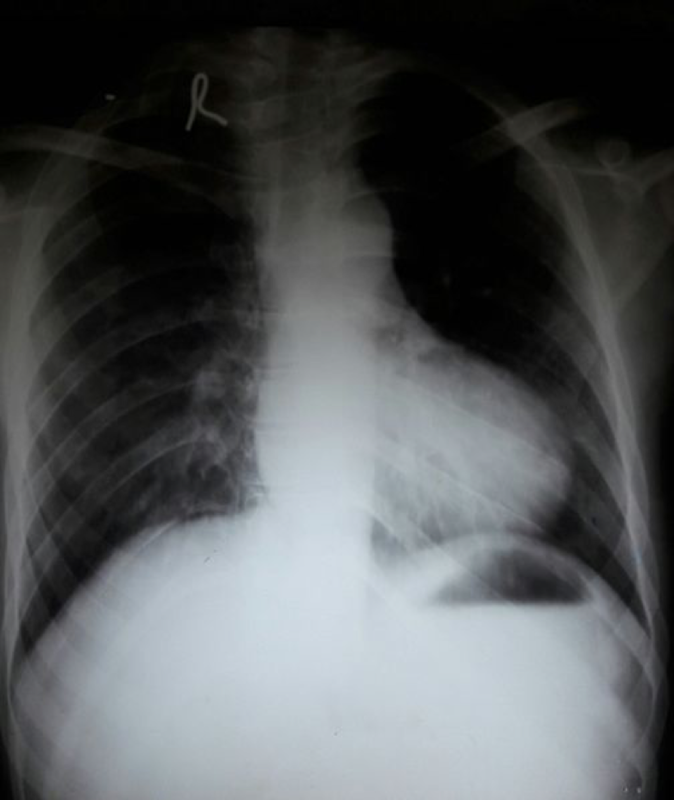 What gives the boot shaped heart on CXR? What is the mortality rate in the first year of life for TOF patients?